The IRS highly targets the meals and entertainment deduction for audits. The reason being is that most business owners don’t understand what is truly deductible when it comes to eating out and other entertainment events. To make sure you understand the concepts, I will be breaking this subject down into 2 sections. Part 1 focuses on meals and part 2 on entertainment, even though they are usually intertwined. Now, let’s dive into meals and how to write them off. There are 2 percentages of deductions when it comes to meals for business owners: 50% or 100%. Deductible meals are when you (the business owner) meets with a client, customer or prospect to discuss business matters. You could be discussing existing business or trying to win over a new potential client but either way, you must have a conversation that leads to you and your business making money. There isn’t any specific food or particular restaurant that is or isn’t deductible, so you could meet your customer for coffee or steaks. As long as the expense you are attempting to deduct is considered “ordinary and necessary”, it is eligible for a write off of 50% of the total cost, including tax and tips. We previously discussed your meals while away traveling for business being 50% deductible. And if you want to read more about that, you can check it out here. Your morning Starbucks is not deductible! Even if you are on your way to the office to do some work, it doesn’t count as a valid business deduction. Neither does your afternoon run to McDonald’s or some other fast food joint. The IRS figures you could have brought your coffee or your lunch to the office instead, so you don’t get to write it off as a valid business deduction. Now, the exception to the rule and the 100% deductible meals are meals provided on site to staff for the employer’s convenience. To be eligible for this deduction, it means you are the employer, you must have an office, and you must have hired employees to work for you at the office. Food must be provided on the premises of the office (can be delivered or catered) and more than half of the staff must be eligible to enjoy the meal provided. Examples of 100% deductible meals could be if the company was launching a new product and employees needed to stay late to make sure everything was ready and the employer had dinner delivered, allowing everyone to eat and work. See, this is convenient for the employer because no one had to leave to get food. Additional types of meals that are also 100% deductible include company picnics and holiday parties and promotional open houses on the site that are open to the general public and are used to advertise or promote goodwill in the community. De Minimis Fringe Benefit amounts covering the cost of small items such as coffee, water, or soft drinks provided free to employees and customers are also 100% deductible. Entertainment expenses have a few more rules to be followed. If the expense is appropriate, it is eligible for a 50% deduction. Amounts paid for parking at a sports arena. However, the cost of transportation to and from a business meal or a business-related entertainment activity isn’t subject to the 50% limit and is 100% deductible. Entertainment expenses generally AREN’T considered directly related if you didn’t attend the event or where substantial distractions can prevent you from actively conducting business (i.e. holding a conversation without screaming or whispering). This includes events like sporting events, the theater, and nightclubs. Now, this doesn’t mean events held in these places aren’t deductible, but it just means they are a little harder to prove. Here you can include the expenses for events like sporting events, the theater, and nightclubs but you will have had to conduct your business discussions directly before or after the event. If you are a big baller and you rent a skybox or other private luxury box for multiple events at the same arena, you normally can’t deduct more than the price of a non-luxury box seat ticket per event. This means you only get to write off the cost of regular priced ticket that isn’t secluded from the rest of the crazed fans at the event. If you pay for meals for the skybox and the cost is separately stated on your invoice, you can also write off the cost of those meals (subject to the 50% deduction). The event’s main purpose is to benefit a qualified charitable organization. The entire net proceeds go to the charity. The event uses volunteers to perform substantially all the event’s work. So, now you know the rules to claim a deduction for meals and entertainment expenses, a clear rule of thumb to ensure you get the write-off is to make sure you are meeting in a clear business setting and you are not trying to entertain people related to you. This helps establish the validity of your deduction if you are ever audited and have to prove your case. Here is a link to the official IRS publication for your reference. Did this help? Are you still confused and have specific questions? 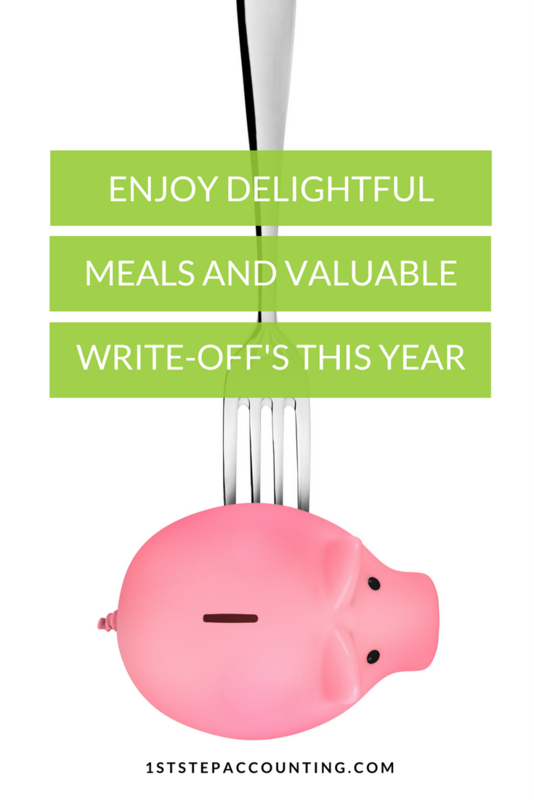 Have you attempted to write off meals that weren’t eligible for a deduction? Please tell or ask me in the comments below.